There are 5 Assisted Living Facilities in the Fort Smith area, with 4 in Fort Smith and 1 nearby. The average cost of assisted living in Fort Smith is $2,675 per month. This is lower than the national median of $3,345. To help you with your search, browse the 21 reviews below for assisted living facilities in Fort Smith. On average, consumers rate assisted living in Fort Smith 4.5 out of 5 stars. Caring.com has helped thousands of families find high-quality senior care. To speak with one of our Family Advisors about assisted living options and costs in Fort Smith, call (855) 863-8283. Fort Smith's slogan is "Where the New South meets the Old West." This 200 year old town embraces its rich history, earning a spot as a “Top Ten True Western Town.” Fort Smith is also home to four ALFs, and one in the surrounding area to accommodate seniors in need of help with activities of daily living. Arkansas defines assisted living facilities (ALFs) by those communities which provide activities of daily living services to residents on a 24-hour basis. 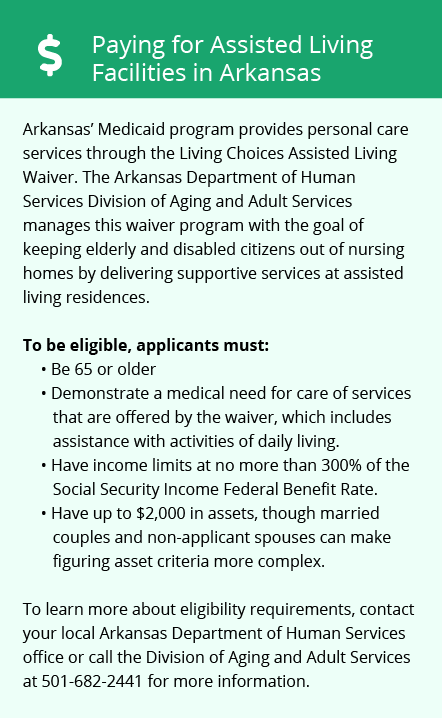 ALFs can be classified in Arkansas as either level I or level II and are governed by The Arkansas Department of Human Services, Division of Medical Services, Office of Long Term Care. In addition to the low cost of assisted living facilities, the overall cost of living in is 17.90 percent lower than the national average, making Fort Smith a potentially wise choice for seniors on a tight budget. Public transit in Fort Smith is limited to the inner-city limits. Charter services are available on request, and buses are outfitted with lifts making them accessible to seniors with disabilities. Violent and property crime score at 60.8 and 66.2 respectively, making them almost double the national averages. This could be a concern for seniors and their families. Fort Smith climate lies fairly close to average conditions in the U. S. with less rain, snow and more sunny days. The average low temperature is 28 degrees which could be difficult for some seniors to handle. The Fort Smith area is home to world-class medical facilities, including Mercy Hospital Fort Smith in the event of medical emergencies or illness. There are many enjoyable things for seniors and their loved ones to do together in Fort Smith. Seniors might enjoy a low key stroll around Riverfront park or a trip to the Trolly Museum to see historic streetcars. Assisted Living costs in Fort Smith start around $2,675 per month on average, while the nationwide average cost of assisted living is $4,000 per month, according to the latest figures from Genworth’s Cost of Care Survey. It’s important to note that assisted living rates in Fort Smith and the surrounding suburbs can vary widely based on factors such as location, the level of care needed, apartment size and the types of amenities offered at each community. 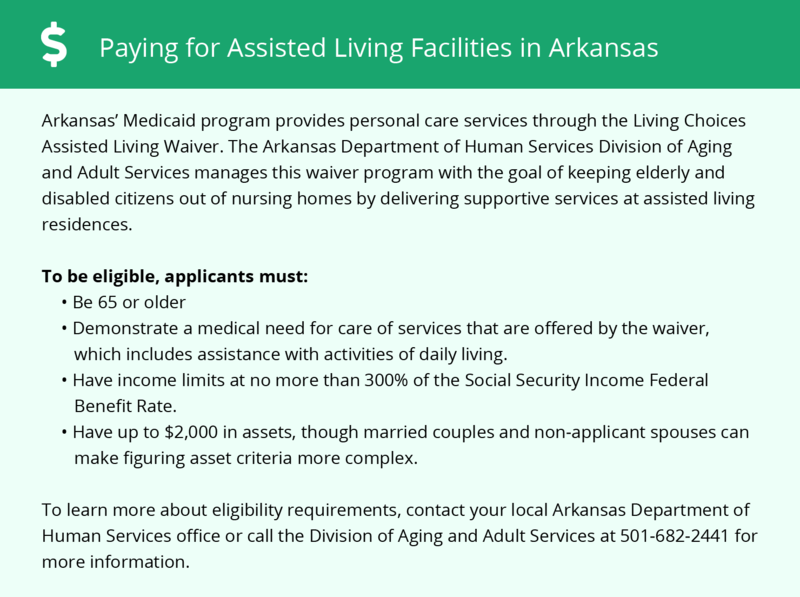 Eligible seniors who need financial aid for assisted living costs are covered by Arkansas’s Medicaid programs. Seniors who need help with Activities of Daily Living (ADLs) can apply through the Personal Care Program in addition to two waiver programs; the DAAS ElderChoices Waiver, and the Living Choices Assisted Living Waiver. To see a list of free assisted living resources in Fort Smith, please visit our Assisted Living in Arkansas page. Fort Smith-area assisted living communities must adhere to the comprehensive set of state laws and regulations that all assisted living communities in Arkansas are required to follow. Visit our Assisted Living in Arkansas page for more information about these laws.